In the space of a week, I recently saw two movies pretty much at the opposite ends of any spectrum you’d care to name – budget, narrative scale, commercial ambitions. 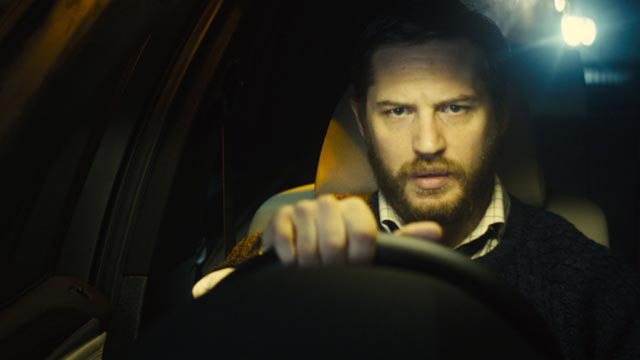 Steven Knight’s Locke is almost literally a one-man show (star Tom Hardy interacts only with voices over the phone), while Doug Liman’s Edge of Tomorrow, in typical blockbuster fashion, virtually buries its characters under a mountain of CG action. The only thing the two movies could be said to have in common is that each is predicated on a narrative gimmick. Locke begins with Ivan Locke getting into his car in a northern town one evening. He starts driving, pauses at a light, and when the vehicle behind him blows its horn, he makes a sudden decision and starts driving south towards London. From then on, we get a series of cell phone calls which gradually fill us in about his life and, more importantly, his character. Locke (Tom Hardy) is the supervisor at a large concrete plant which, at dawn the next day, is facing its largest contract ever, with hundreds of trucks coming in from various parts of the country to load up for a massive construction job. It’s Locke’s task to make all this go smoothly, but he’s driving away from it. He calls home and speaks to his two sons, who are excited about an important football match he was supposed to watch on television with them. Locke is obviously stressed, trying to reach his wife with something important to tell her. And then there’s Bethan (voice of Olivia Colman), a panicky woman being rushed to hospital to give birth. We learn that a year earlier, on a big job down south, Locke celebrated a successful conclusion by relaxing with his assistant, Bethan, over wine. One thing led to another and for the first and only time in his life, he was unfaithful to his wife. And his middle-aged, single and unhappy assistant happened to become pregnant and, because it was her “last chance”, decided to keep the child. During the ninety minute drive towards London on the motorway, Locke has to juggle three quickly unravelling threads – managing the job at a distance through Donal (voice of Andrew Scott), an inexperienced, frightened subordinate, while staving off increasingly threatening calls from his own boss, Gareth (voice of Ben Daniels); the necessity of finally confessing his transgression to his wife, Katrina (voice of Ruth Wilson); and reassuring Bethan that he will be there to help see her through the birth. Bethan keeps asking him to tell her that he loves her, but he can’t do this. He loves Katrina and his family. But he’s determined to take responsibility and do the right thing by accepting the new child as his own. Locke is a small, intimate story about a fundamentally decent man whose life implodes because of that decency; in refusing to abandon his responsibility to Bethan, he loses both his family and his job (even though his long-distance supervision does ensure the success of the latter). There are no huge revelations, simply a character coping as best he can with the consequences of his own actions, and Tom Hardy’s performance is riveting in its low-key lack of melodramatic histrionics. It’s the sheer ordinariness of the character that makes Locke a fascinating experience. Who knew that the intricacies of concrete could be as suspenseful as a man confronting the loss of the family which means so much to him? Steven Knight is a successful television (Peaky Blinders) and feature writer (Dirty Pretty Things, Eastern Promises), here directing his second feature after the not very satisfying Jason Statham vehicle, Redemption (2013). Although Locke is conceptually rooted in a gimmick – can you make an entire film with one actor in a car, more or less in real time? – Knight and Hardy manage to breathe genuine life into it and the viewer is likely to find him- or herself caught up in the stakes arising from Locke’s moral decision. There are no moral decisions to be faced in Doug Liman’s sci-fi epic Edge of Tomorrow, based on a Japanese novel by Hiroshi Sakurazaka. To put it crudely, this is essentially Battle: Los Angeles cross-bred with Groundhog Day. Earth has been invaded by aliens called Mimics, which bear some slight resemblance to the Tasmanian Devil as they swirl around in a blurred cloud of filmy limbs with vicious mouths agape. When Major William Cage (Tom Cruise), a military PR officer, makes the mistake of refusing an order from General Brigham (Brendan Gleeson) to accompany the troops on the invasion of occupied Europe in the morning, he finds himself stripped of rank and stuck in a platoon of misfits with no idea of how to use the high-tech weaponry he’s forced to wear. Not surprisingly, he doesn’t last long on the beach, but just as he dies he manages to kill a Mimic which splatters him with its blood. At which point he abruptly wakes again at the beginning of the previous day. After living through the same events a number of times, gradually improving his performance because he knows what’s coming next, he makes contact with the heroic Rita Vrataski (Emily Blunt), who just before they both die again on the beach tells him to “come and find me when you wake up”. It turns out that Rita’s heroic performance at Verdun was a result of her having gone through the same experiences as Cage. Contaminated by alien blood, she found herself with the power to reset time, learning more and more about the enemy before each subsequent death and reset. This, it turns out, is the secret of the aliens’ success: their army is controlled by a central brain with the power to reset time, so that they can study and learn about their enemies until defeating them is inevitable. Under Rita’s guidance, Cage goes through a seemingly infinite number of resets, each time drawing closer to the central brain, turning the Mimics’ tactics against them. And so Edge of Tomorrow is like nothing so much as a video game in which the player gradually works his way up through the levels towards a final goal. And this is its chief weakness as well. In the initial stages, it’s undeniably entertaining watching Cage cope with the situation, but once he knows what’s happening, the movie starts to take on an air of mechanical repetition. Despite set-backs, we know he’ll eventually learn enough to defeat the Mimics and while the early scenes actually offer some degree of character development, Cage and Emily are inevitably swept away by the necessities of plot and action. Which is too bad because Cruise and Blunt work well together in the first half and actually generate some appealing chemistry. In true blockbuster fashion, at the end even the suggestion of genuine sacrifice is swept away. The movie’s central conceit, that ability to reset and gain a fresh life, manages to make the stakes dwindle away to nothing. When you can’t die, nothing really matters. 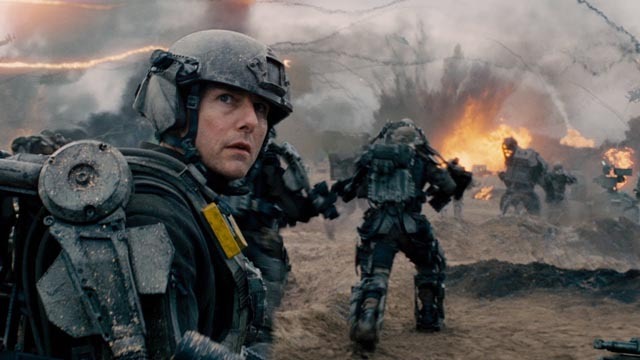 In Edge of Tomorrow the fate of the world apparently hangs in the balance, while in Locke it’s just one man’s marriage and job … yet it’s in Locke that decisions and actions have significant consequences for the characters – Locke himself in his car, as well as those he speaks to over the phone – and so this small movie provides the more gripping drama. This entry was posted in Commentary, Review and tagged Action, Actors, British Film, Directors, Science Fiction. Bookmark the permalink. Totally agree with you. In the end it’s Locke gripping drama that did it for me! It’s unfortunate that, since the advent of the blockbuster culture in mainstream Hollywood in the late ’70s and ’80s, the studio people responsible for so many popular movies seem to have forgotten the value of characters to a story. All the amazing technology which has been developed in the past few decades has too often become the driving force of production, rather than being used to support involving narratives.